Yesterday was my annual trip down the river – white water rafting to be specific. I say annual since I went twice last summer and now again this summer. That is a trend my friend and one I hope to continue when possible in the future. It helps to have a friend who is a former river guide and owns his own boat. Today he is a top-notch organizational development consultant. Check him out as time allows at VisionPoint Consulting. Okay back to the water. Let’s get the obvious metaphor out-of-the-way. 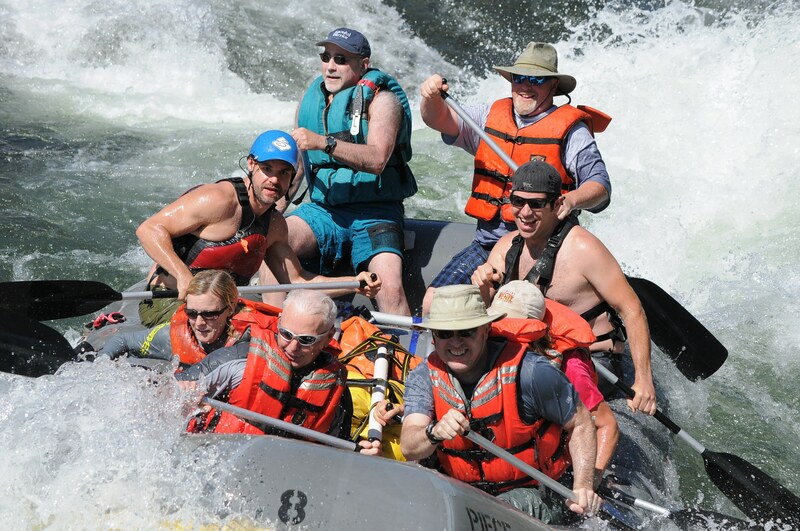 A trip down the river (South Fork of the American River in California) with periods of serious rapids can act as a metaphorical journey for us as leaders. We had periods of calm water followed by periods of white water to challenge our team. We prepared as best we could and adapted along the way. Teamwork was vital to our success. Leadership metaphor on the river … check. It was a great day with just four of us handling the boat that can carry nine. There was my friend Steve, our leader for the day. My coworker Jeremy ready to try new adventures and Greg, someone new to meet and get to know while working the rapids. A great day and yea, I thought about leadership and what I was experiencing while we worked our way down the river. Once I got the obvious metaphors listed above out-of-the-way, something else occurred to me. It started with Steve admonishing me for calling my paddle an oar. We are on a raft and that is a paddle I am holding. My DNA is fixed and for me it is an oar. I rowed and raced competitively for seven years in high school and college. I am formed from my days as a crew member and rower. It felt great to hold a tool to work through the water and propel my boat forward. For me I held an oar, but Steve was right. It was a paddle and I was in a very different type of boat. So I go deeper into metaphor to look at oars and paddles and what they teach us as leaders. The oar represents my crew days. We raced and absolute precision and teamwork was the rule. We strived for “swing” where the boat becomes one and we move the boat with an effortless feeling. Our oars connected us to the water and served to balance our strokes. One would think we had a death grip on those oars, but no. We held them with a light touch and felt the energy from the crew moving the boat forward ever faster. With the oar in hand, we hurt. We were athletes pushing to the limit. Alas, yesterday I did not hold an oar. It was a paddle and we were in a white water raft. Indeed we had to work together, but it was very different. There was no precision. We were committed though, not to be fast, but to find the right line and fight through the rapids. Each of us got knocked down and knew it was vital to get back up and paddle as our lives depended on it. With the paddle there is a general plan to get down the river. We adjusted along the way and had a great run. With the paddle in hand, we smiled and could not wait for the next rapid. Both the oar and the paddle have one thing in common. A commitment to the boat and her crew. Today’s post was full of metaphor of how a trip down the treacherous white water can remind us what is important for team work and leadership. It also served to remind me of my days holding an oar. The oar and the paddle – tools for WeMoveTogether. Last year’s trip. That is crazy me in the front of the boat wearing a hat. Paddle in hand. Notice the smiles. That’s awesome! Can’t imagine the rush! Thanks Lou – big time rush and I loved it all.